Weezer finally made their way back to Rochester Saturday night as they set up shop inside the sweltering Main Street Armory. 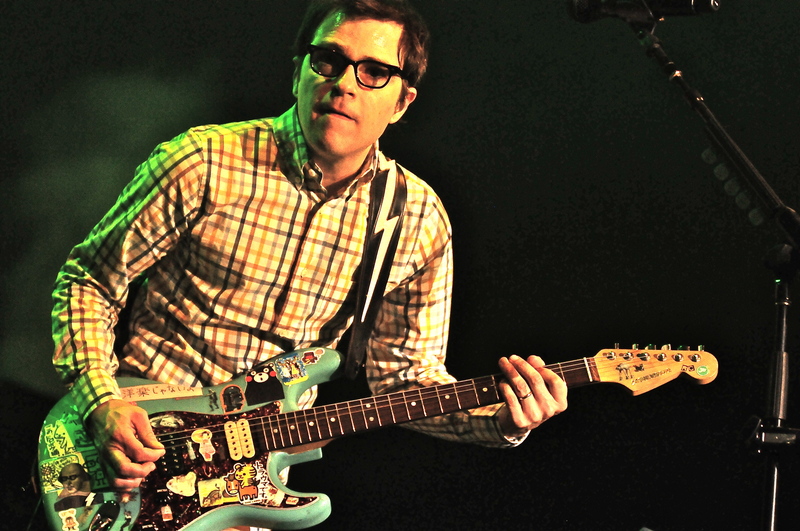 Singer Rivers Cuomo probably made some new friends when he announced to the crowd that he used to live in Rochester until he was four years old. The crowd cheered loudly as the band delivered hit after hit during their eighty minute show. Cuomo had the near capacity crowd at his mercy as Weezer delivered an agglomeration of songs that covered almost every inch of their discography. The band played as a four piece which meant Patrick Wilson was back behind the drum kit. Those who attended the band’s show out at CMAC in 2010 will remember Wilson was on guitar with Josh Freese manning the skins during that period. Bassist Scott Shriner and guitarist Brian Bell rounded out the lineup which has been the band’s foundation since 2001. The band began with “My Name Is Jonas” which led to the familiar chords that started one of the bands most beloved songs “Hash Pipe”. The acoustics were about as good as they could be in the cavernous Armory which was built in 1905. The band has already had two albums produced by Cars mastermind Ric Ocasek, who coincidently will be at the controls on their upcoming fall/spring release currently titled Everything Will Be Alright In The End. Although no new songs were played (they had sprinkled some in recently) the band chose to stay with the hits and a few lessor known gems. Other than the large lighted Weezer logo illuminated behind them, the stage was just a basic set up although the lighting was a little more elaborate with various effects. It was mid set where the band started to mix in some rarities (Susanne), and other lessor known songs of the bands storied catalog (The Good Life, Keep Fishin’, El Scorcho). Weezer has built a remarkable catalog of songs over the years. Their infectious power pop hits such as “Pork And Beans” and “Beverly Hills”, leave fans at the very least tapping their foot. When it comes to power pop Weezer may very well be in a distinct class all by themselves from their era. Despite the scorching temperature inside, the addicting music kept the fans from leaving right until the last song played “Buddy Holly”.